In 2012, 3Form Inc. became a $100m company. 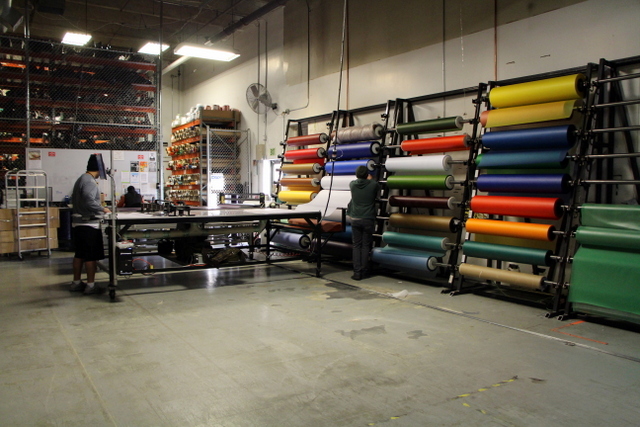 Centrally located in Salt Lake City, they are a power house in the glass and plastic lamination industry. 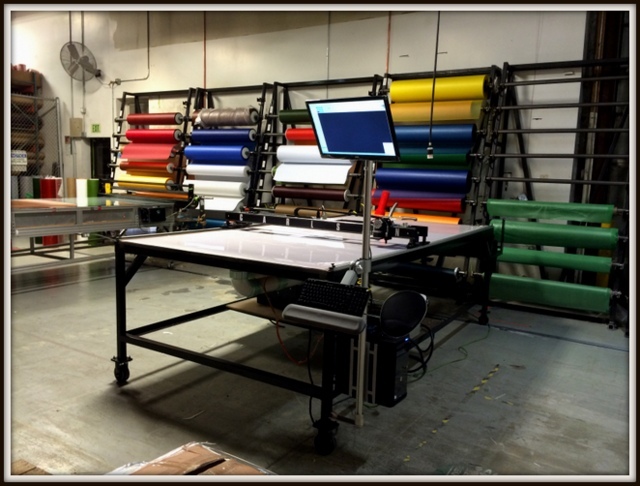 To service their customer’s needs and designer’s imaginations, they need A LOT of different interlayer laminates. Pick a color, any color! And that's not even half of it! 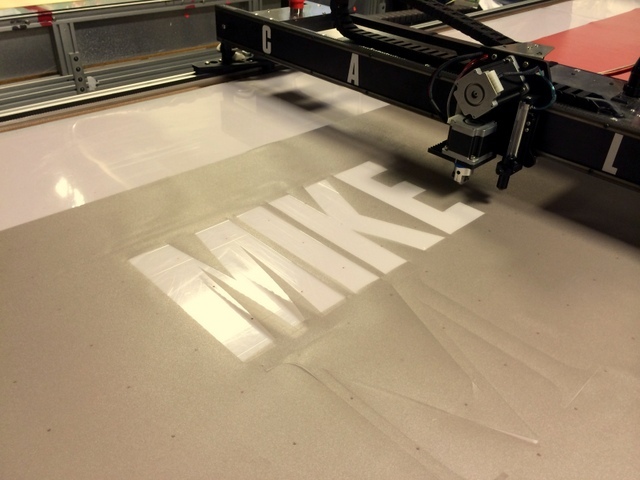 They are also committed to providing custom products, engineered solutions, and a best-in-class “green” foot print. This meant they need a laminate cutting solution that minimizes waste, improves operator efficiency, and can work with their wide variety of materials. 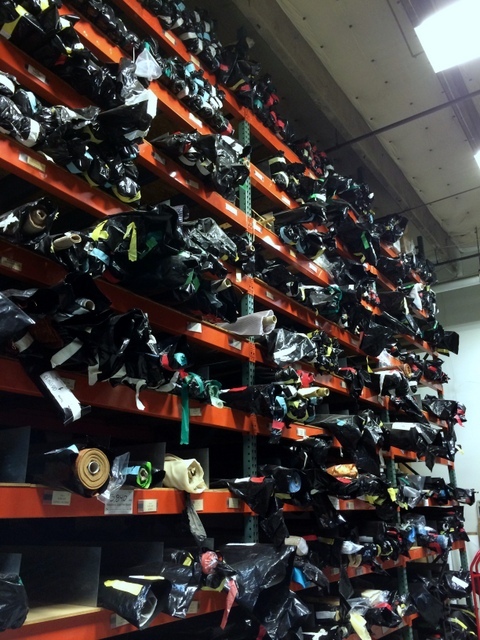 This solution also needs to work with their existing 50′ long wall-of-material roll holders. 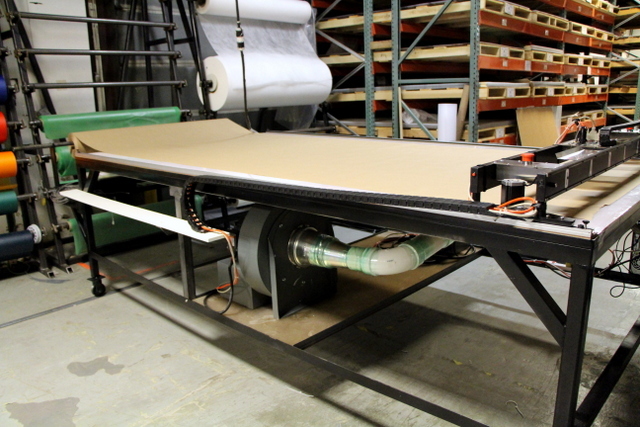 The solution was a rolling vacuum table and a Carlson Design plotter/cutter. The 3Form Team Give Carlson the "Thumbs Up"! The Carlson cutting system was an ideal choice. 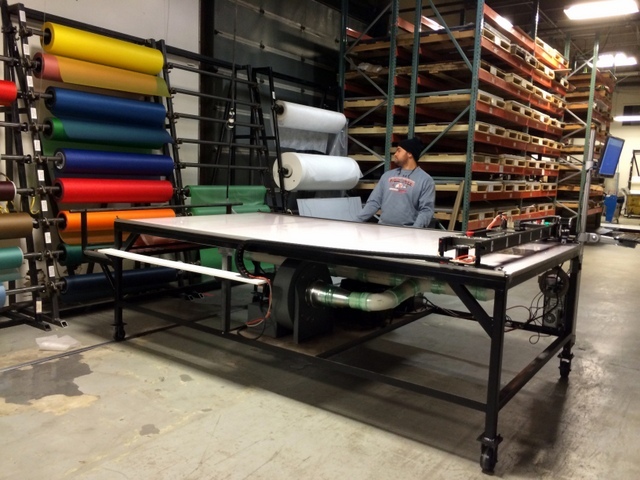 It is light enough to roll, robust enough to run two or three shifts, simple enough for anyone to operate, and we are dynamic enough to work with their custom “home built” table and programming needs. Oh, and it’s all at a price that can’t be beat! After the first month they reported: “The cutter is working awesome. 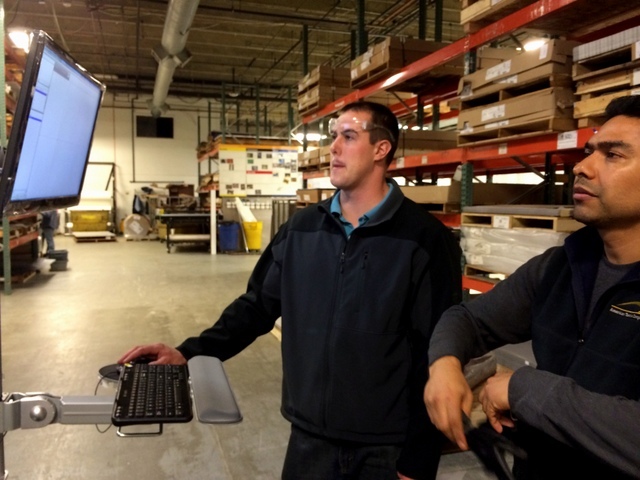 Everyone, from the guys cutting the material, to the guys using the material loves it.” -Joseph Taylor, Sampling/Inventory Manager – Jan, 2014. 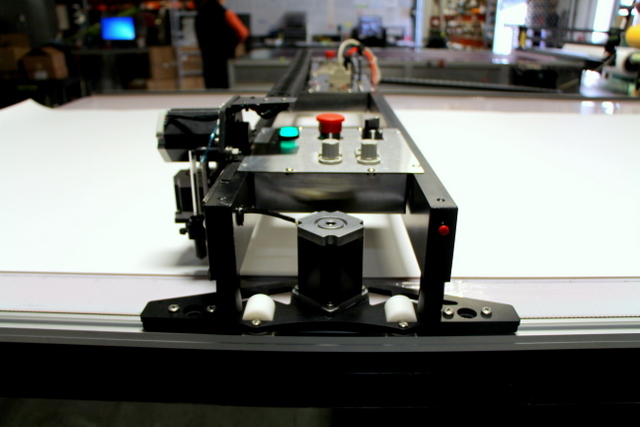 The PTi is our most industrial model plotter/cutter, designed specifically for cutting heavy laminates, working in an industrial environment, and operating 24/7 with little or no maintenance. The PTi features a 3X stiffer gantry, 2X larger Y & Z motors, and 33% more powerful X motors with load support wheels to reduce wear. This is the toughest, simplest, most rugged, and most affordable large bed cutting system on the market. Load wheels support the added weight of the stiffer chassis and reduce wear. 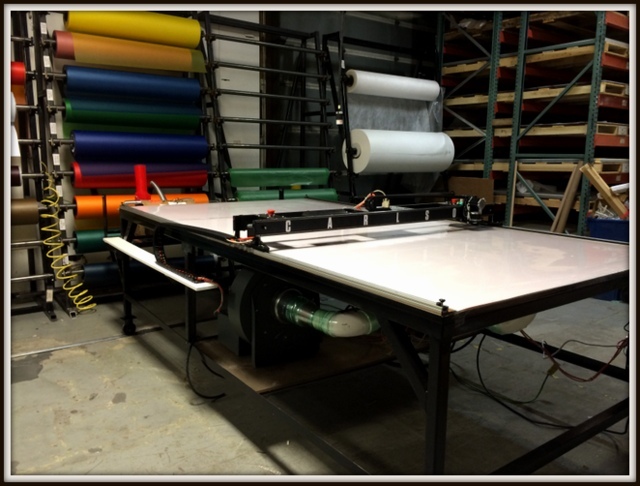 The taller frame rail accommodates a larger Z motor with 2X more power, allowing the PTi to cut heavy laminates. 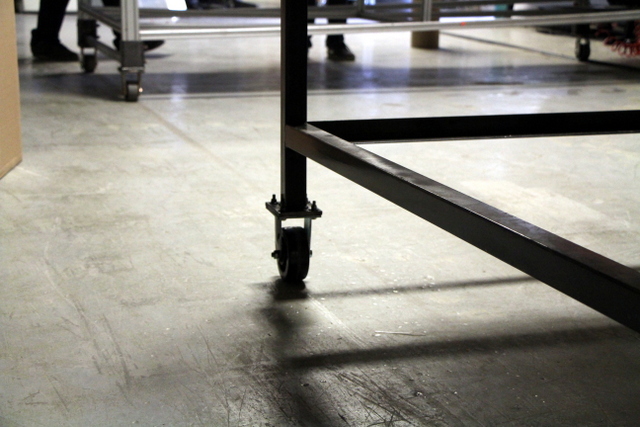 Before we arrived, they built an 11ft steel table frame on wheels. 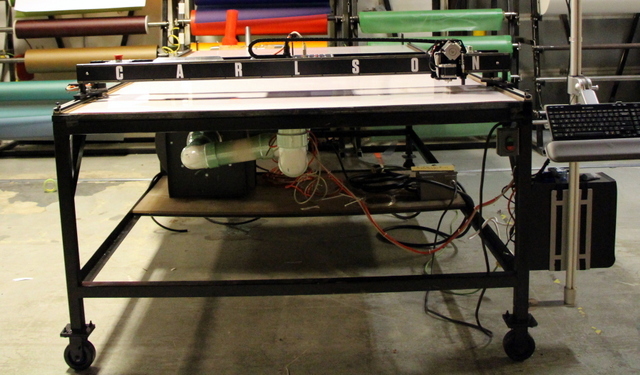 The table has a 50′ long run, and can slide from rack to rack. 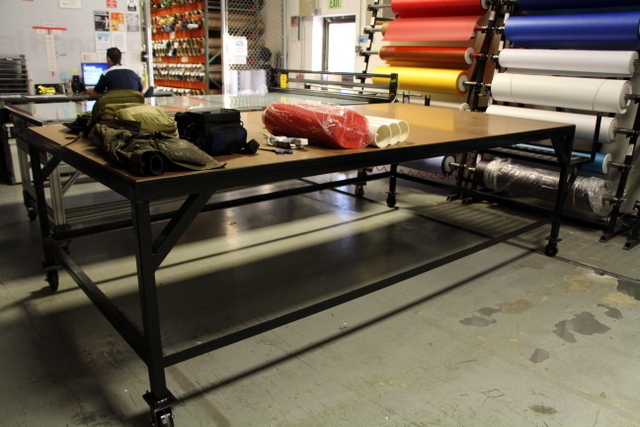 Our Phillocraft vacuum tops drop into their custom built rolling-frame steel table. The operator can push/pull the table where it's needed. 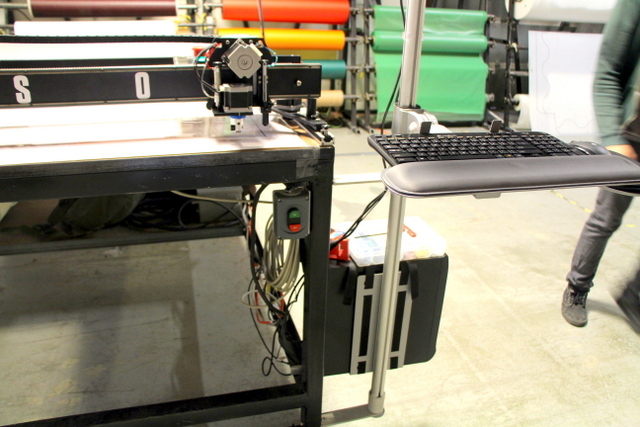 The table is completely self contained -- cutter, vacuum blower, computer, monitor, workstation are all mounted to the table. It's easy to cut many different rolls! Together, two operators pull material. 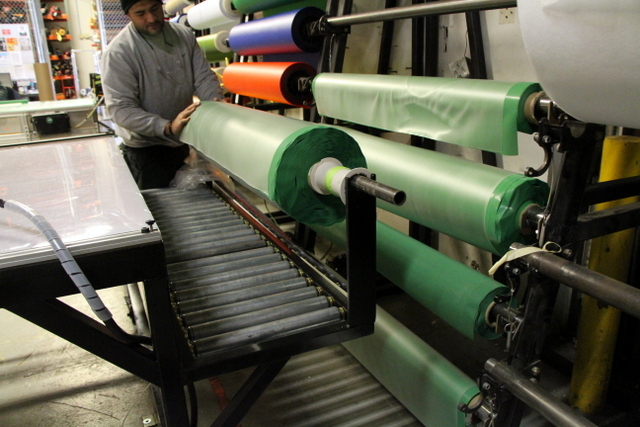 One runs the cutter and rolls material. The other loads the table. The machine is set to conveniently park 30" from the origin, allowing for material clearing and material spreading. Again, at 3FORM, Switching materials is easy! 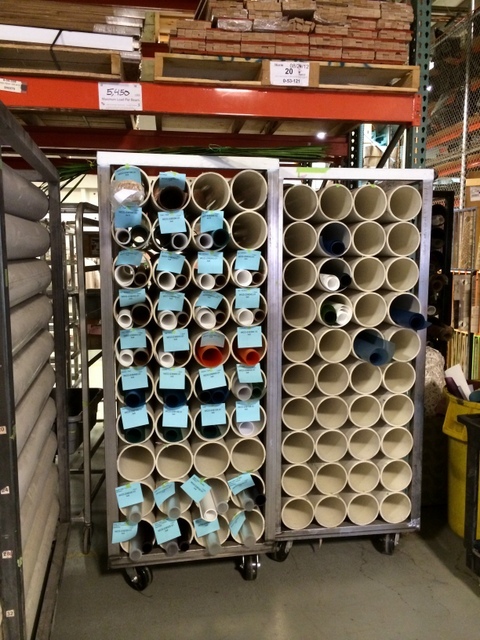 They also have a table mounted roll holder to cut material NOT on the wall racks. 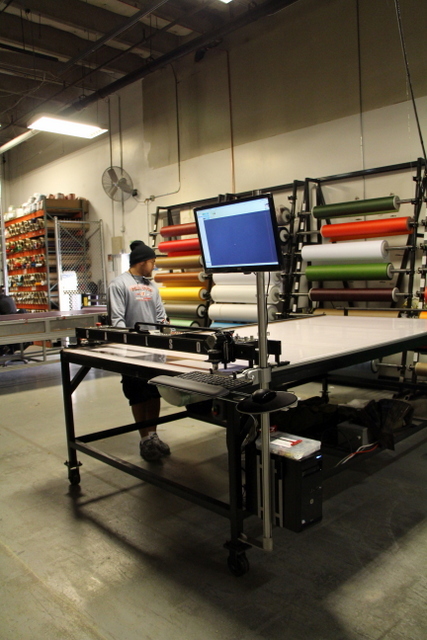 Here is a one minute video demonstration of cross cutting 96″ long sheets of .015″ PTG laminate: https://vimeo.com/84319271. Using the PTi-72 to cross cut is similar to their old solution of slitting. Old and New cutters side-by-side. The old slitter will ONLY cross cut material. It also struggles with thicker material like .050" TPU. No so with the new Carlson. 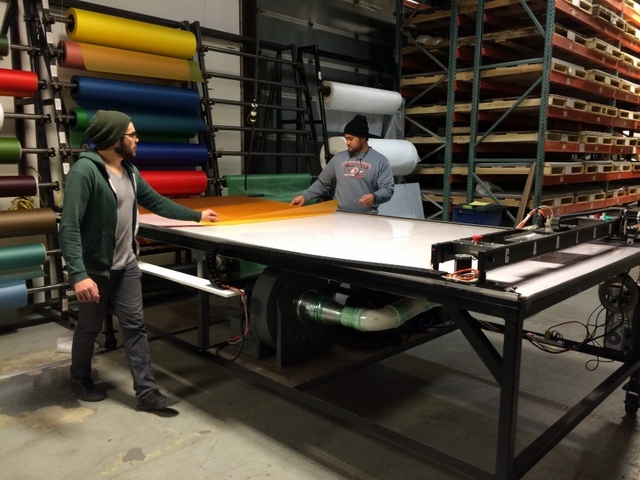 If they wanted to cut a 71″x39″ rectangle out of 60″ wide material, how would they do that? 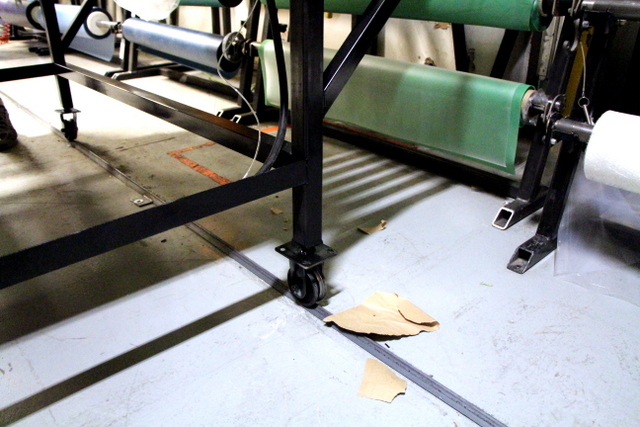 Before, they would cross cut the roll 71″ long. This would go to another department for trimming. With the Carlson, cutting parts to size is a no-brainer. 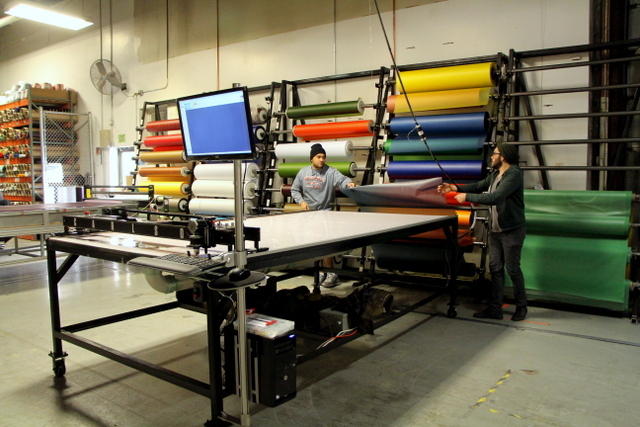 Here’s a video of that 71″x39″ cut: https://vimeo.com/84311596. 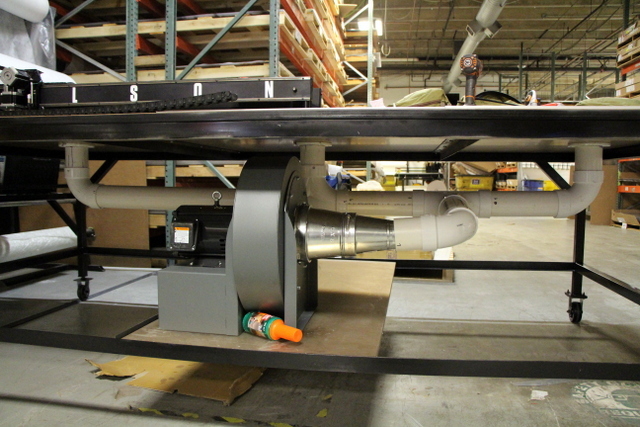 The real savings come when they start quickly generating and nesting custom parts. 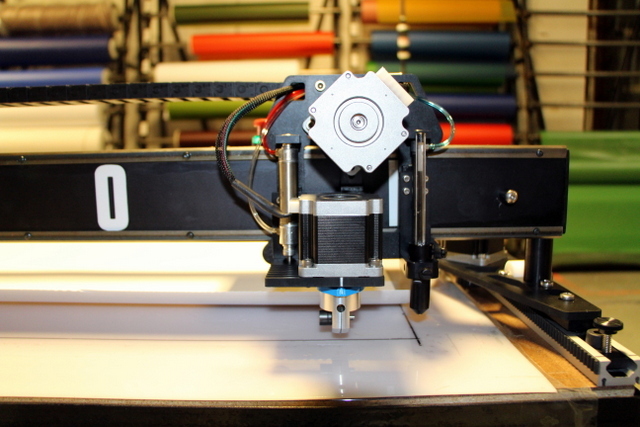 Our software has a built in rectangle maker and free CAD program for custom pattern creation. It can also import *DXF CAD files or import a list *.CSV file format. For simple shapes our manual nesting program is quick and easy to use. 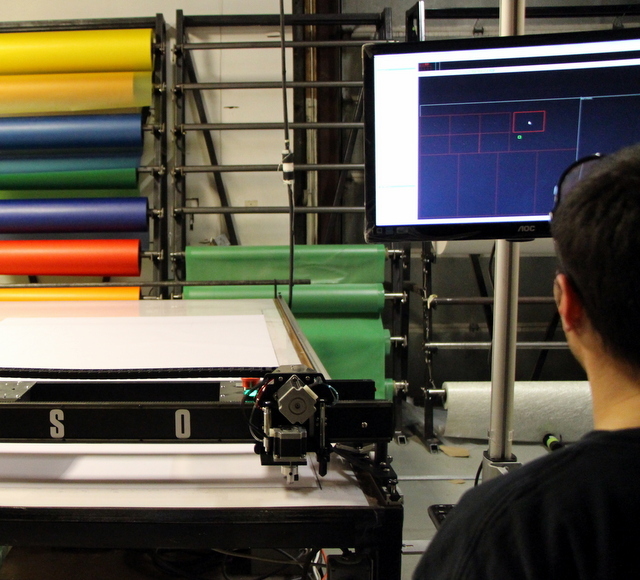 More complex shapes or larger quantities of patterns can run through our autonesting program. The operator can minimize material waste by nesting multiple orders. For custom parts and smaller pieces, nesting can result in big savings. 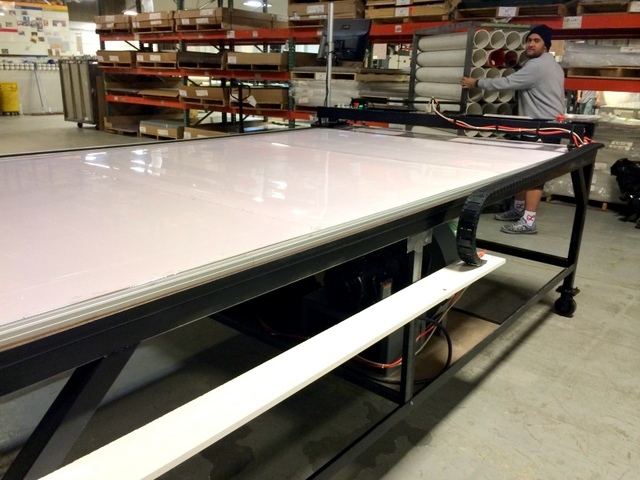 We’ve seen anywhere from 15-35% savings in the glass lamination industry. In the following video we cut over a dozen pieces in two minutes. Our nesting software virtually eliminates any scrap. Our optimizer further saves time by eliminating redundant cut lines. The result is a fast, efficient, and waste free cut that is very, very repeatable: https://vimeo.com/84316733. 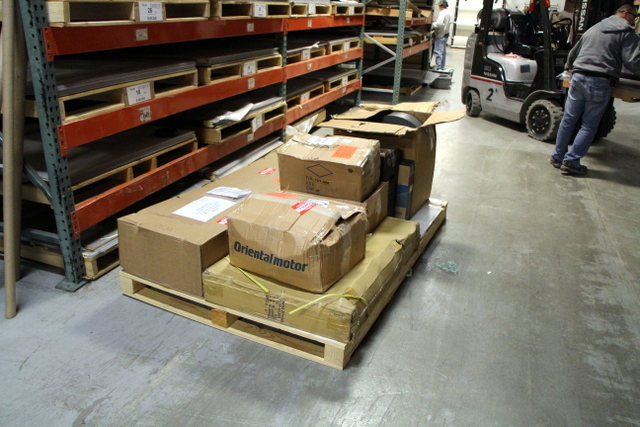 After cutting, parts are placed in labeled racks before being wheeled to layup. They keep track of job numbers using a simple roll-and-rack system. 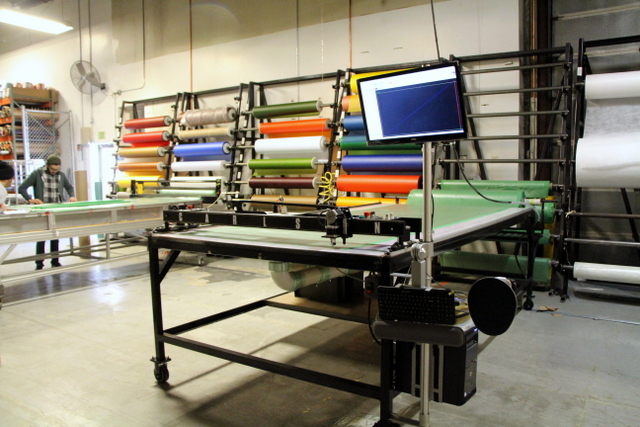 This is a great system for cutting interlayer and we look forward to reporting future success. We would like to give a big THANK YOU to Joseph, Tommy, Mike, Sam, Enrique, Alex, as well as Jeff and Tom from the maintenance department. 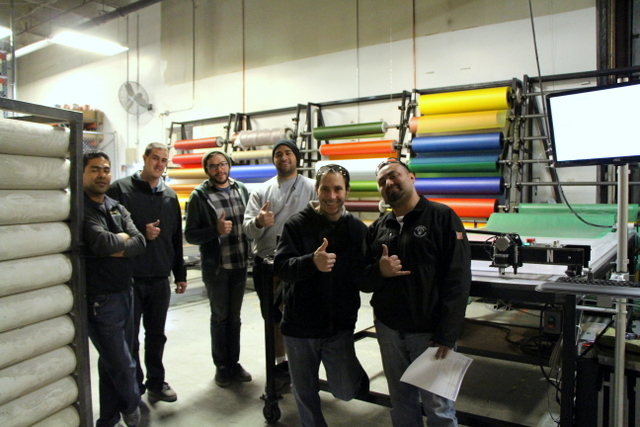 If you are interested in learning more about how we setup their cutter, trained their personnel, or just seeing more plotter/cutter pictures, then please keep reading! We are going to review the installation and training. Most of this will be explained by pictures and captions, making it easy to cover a lot of ground in a little time. 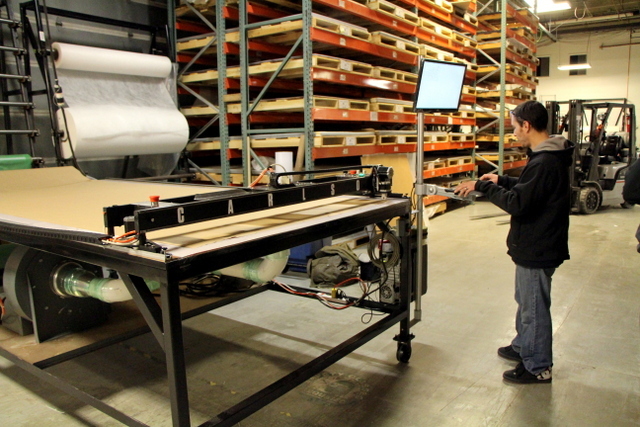 Your plotter/cutter will arrive on a pallet. 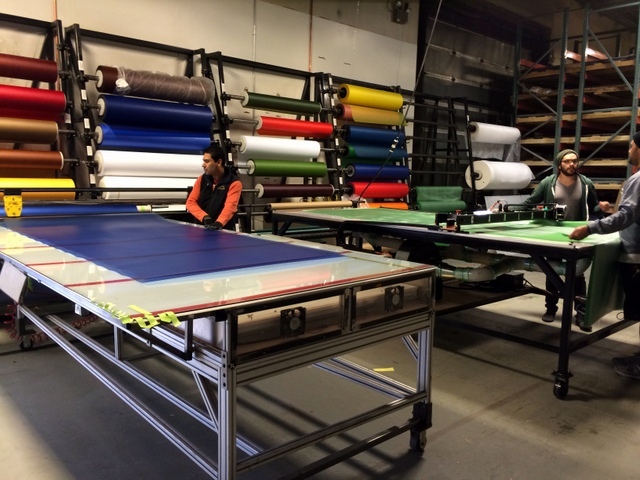 In their case, we shipped the table tops separately weeks in advance so they could have their table ready. Setting up the table before we arrive -- whether it's from Carlson or home built -- is a great way to speed up the installation. A faster install means more time training! Here's a close look at their table wheels. 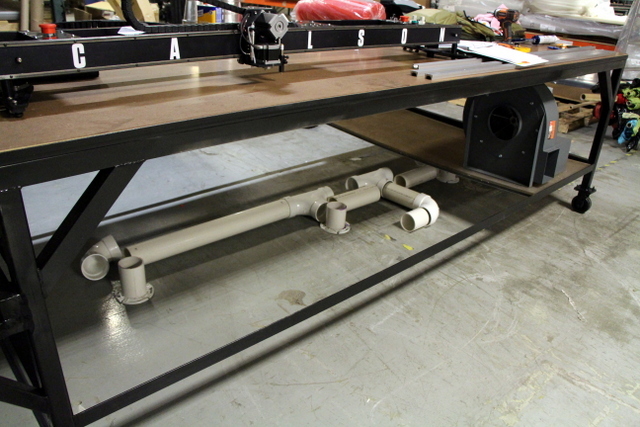 The side closes to the roll racks is guided by a floor mounted track. We installed the plumbing first so their electrician could wire the 5HP radial blower. It's important to consult a local electrician to make sure everything is up to code. The plumbing is attached to the table with wood screws and caulk. 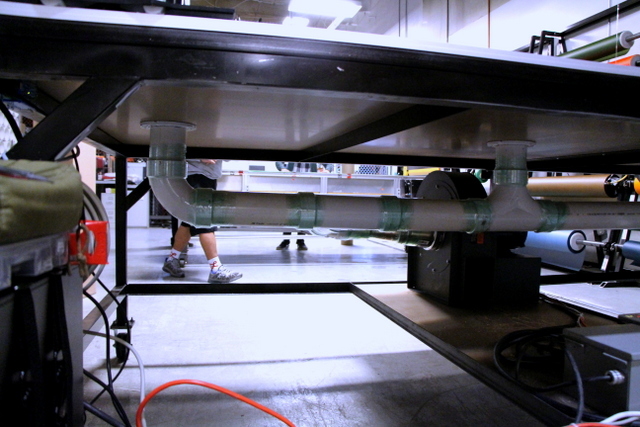 Note the blower is mounted to the table so it can easily travel with the table. Wrap your plumbing in plastic stretch wrap (included with table purchase) there are no air leaks. 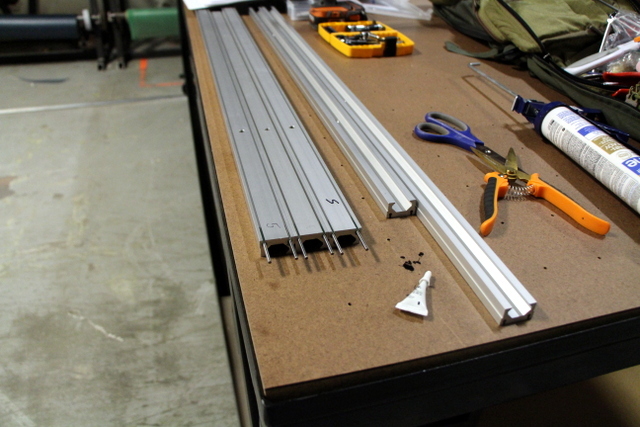 Insert track pins and install track using the plotter/cutter as a jig. This will ensure side A and B are parallel. 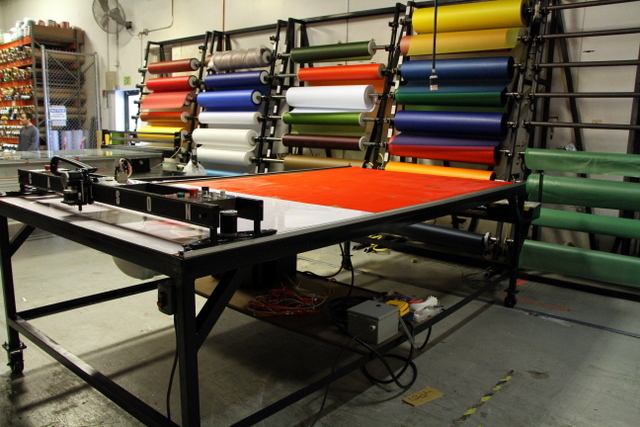 The red surface on the table is a woven mesh that goes between the cutting surface and the vacuum table. We attached the computer and monitor to the table with a custom monitor mount. We avoid using PLC workstations in favor of a much simpler Desktop Windows PC. If the computer dies, replacing it is as-easy-as driving to the local office supply store. The Keyboard folds down, and out-of-the-way when not in use. You should always wire the blower's on/off switch near the operator's workstation. After assembly, the cutter NEEDs cable management. Time to make everything pretty. Tie wraps and zipties keep wiring clean. 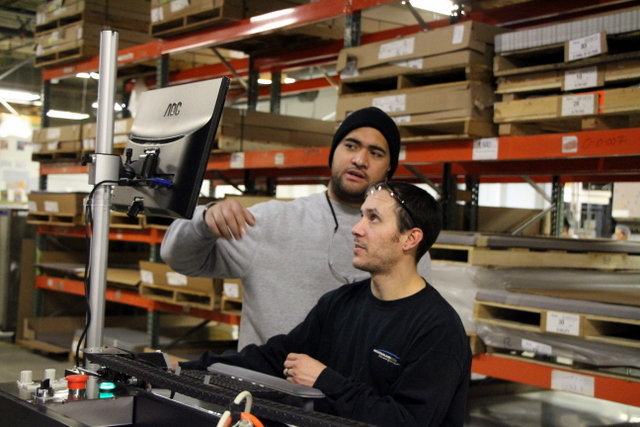 To improve mobility, we used a side-mount cat-track for easy cable management. 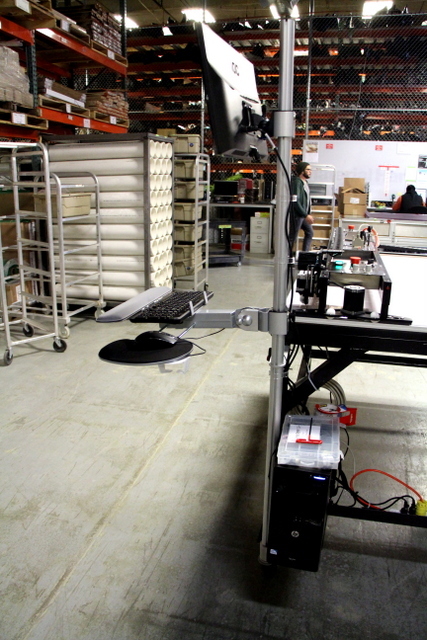 Side mount e-chain shelf duels to improve table rigidity. 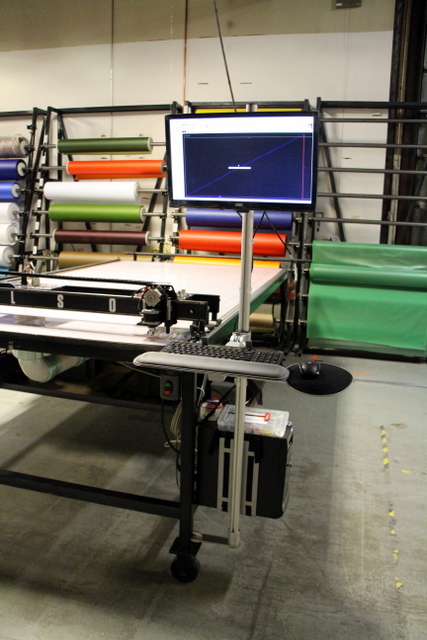 Your plotter/cutter is now installed! Now begins setup, pattern creation, and training. Calibrate the machine. We are checking the X and Y scale factors AND squaring the machine. 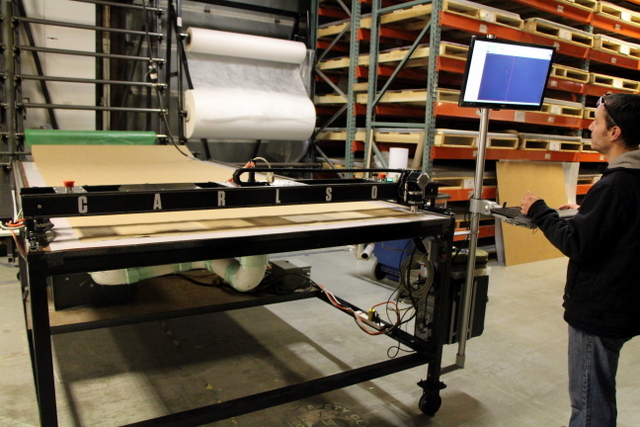 Butcher paper or scrap material is great to plot your calibration marks. We began by training Tommy and Mike, two senior operator's. Once trained, Tommy taught Sam. You have to really understand something in order to teach someone else. It looks like Sam already has questions for you Tommy! ...How to cut his name out of PTG!!! We were thrilled to work with such a dedicated team. 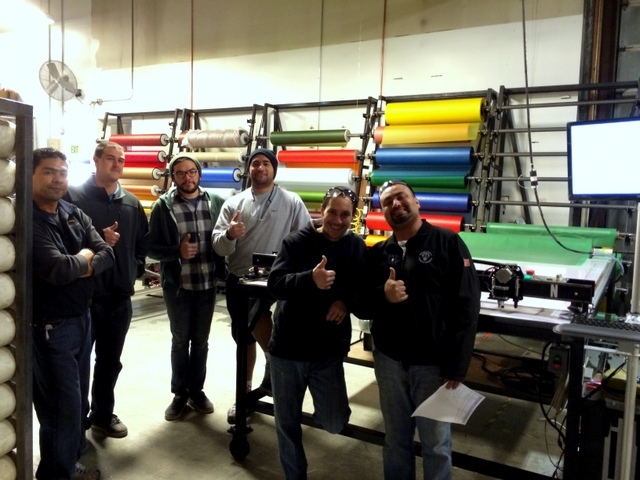 These guys worked hard to integrate a new piece of equipment into their workflow. We are glad to hear it’s all thumbs up!